3WallBall Outdoor World Championships: Save Big On Room Rates! 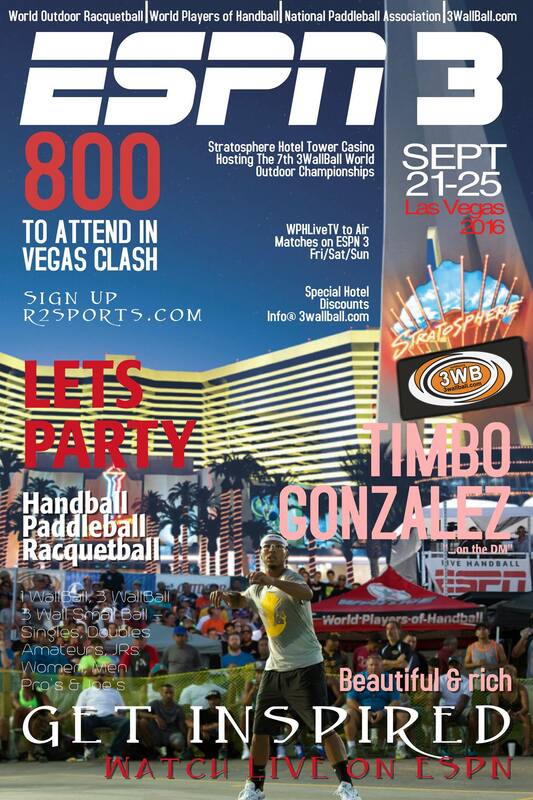 September 21-25, 2016, get ready for the 3WallBall Outdoor World Championships in Las Vegas, NV, featuring Racquetball, Handball & Paddleball ~ amateurs, juniors, women, age-division, skilled classes, Pros & Joe’s and you are invited! The Stratosphere Hotel Tower Casino is the official host of the 3WallBall Outdoor World Championships ~ now in its 7th year! Without the Stratosphere Hotel and key supporters, the big combined Racquetball ~ Handball ~ Paddleball event just would not happen. Hotel rates: $51.00 per night Sunday through Thursday & $145.00 per night Friday and Saturday. U2, Drake, Billy Idol, Florida Georgia Line, One Republic, Ariana Grande, Pitbull, Usher, Sting, Britney Spears, Los 5, Sia and More! Hotel rates for the Stratosphere, when using the special event code, were set just as 2015 turned to 2016 and before the music festival boom even hit the calendar. The Stratosphere Hotel gave the 3WallBall Outdoor World Championships a nightly rate that cut the other hotel’s best offer(s) square in half. Not counting some fees & taxes and based on Hotel.com’s search for two adults & two beds; while looking at all three-star hotels w/in 2 miles of the venue and beyond – Thursday, September 22nd, through Sunday, September 25th, 2016 – Just $114.00 per night w/even lower nightly rates when adding more days ~ Wed-Mon at the Stratosphere is $89.00 per night! ***The nearest “name-brand” hotel w/in a reasonable walking distance is Circus Circus. Their rates are almost $50 dollars more a night, are poorly rated w/3 stars and are located almost a mile down the street. Shop and compare, plus factor in safety, walking distance, accessibility and the knowledge of knowing that the Stratosphere Hotel, event staff, employees and sponsors are holding this event for you! The 3WallBall Outdoor World Championships, plus regular night-life and surrounding music festivals have already booked-up the Stratosphere (now nearing the 50% occupancy mark). Last year, in mid September, the Stratosphere Hotel Sold-Out All Rooms. Book your hotel now, as this property will sell out; forcing event players, fans and friends to fend for themselves at an overpriced-off-the-strip location in what could be a lesser star rating or neighborhood. Details @ www.3wallball.com. Want to Watch or Play in this year’s event? Click the link(s) below to gather more information about the biggest combined court-sport tournament (where anyone can play) in the history of the outdoor game. Located at the Stratosphere Hotel Casino Tower, September 21st-25th, 2016 and set to air on ESPN3 & WatchESPN App Fri-Sun. Once on the event(s) webpages (r2sports.com) use your tabs for entry fees, rules, daily schedules, further hotel info and more!